This is the Mexico you came to look for!!!. A full-day trip from Acapulco to Taxco de Alarcón of no less than 13 hours. Enjoy a drive through the mountains of the Sierra Madre and browse the very best silver shops in Mexico, then begin a wonderful walking tour through the cobblestone designs winding streets always in company of your very personal tour guide. 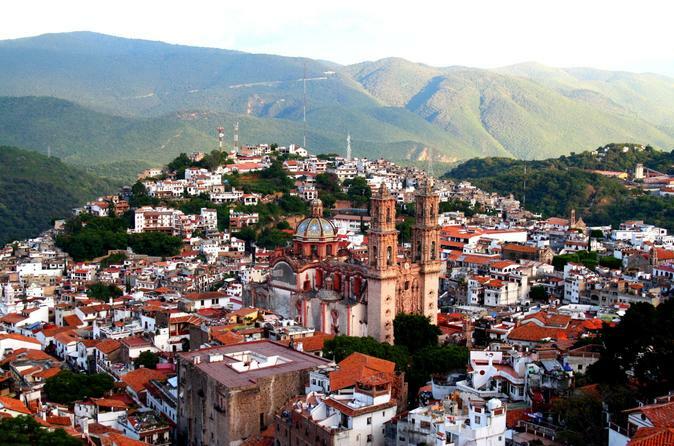 Learn about Taxco´s Aztec and Spanish culture, and continue to the main plaza to get a taste of daily life and culture. Visit the iconic church of Santa Prisca and enjoy plenty of time to explore the zocalo at your own pace before returning to Acapulco. Leave early in the morning (7:00 am) on your way to Taxco, make the first stop for breakfast at a restaurant in Chilpancingo (not included). Then continue on your way to Taxco and drive through the second largest City of the State, Iguala, afterwards continue the trip arriving to Taxco at approximately 11:00am. Enjoy ave a guided walking visit to the city in company of your PRIVATE tour guide. Then, your guide will take you to the local Restaurant for lunch ( not included, unless specified). Visit the world famous Santa Prisca and San Sebastian Taxco Church, The Main Square. Have some time at leisure for shopping at the Plaza before heading back to Acapulco.